I hope you are all ready, tomorrow night should be one for the Santa Monica history books. 4 killer bands, great venue, food & drinks, good company and for only $7. The line up is below, I hope you can make it out. If the response is good this will become a monthly thing, so please support local music and this blog by coming and grooving with us. Big Moves just was named Deli Magazine's LA Artist of the Month for May. 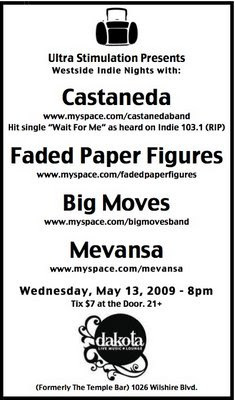 Faded Paper Figures is playing one of their final shows before band member John moves to the East Coast. Don't miss this, big things people! Oh, and that offer for me to buy you a beer still stands. Podcast #2- Why Aren't They More Famous?